Did You Still Feel Annoyed By Being Bitten By Mosquitoes? Are You Worried About The Potential For Fire Hazards From Exposed Mosquito Coils? This Mosquito Coil Holder Is Your Great Safety Guard. The Compact Size Makes It Easier To Use In A Variety Of Open-Air Area To Drive Away Mosquitoes. 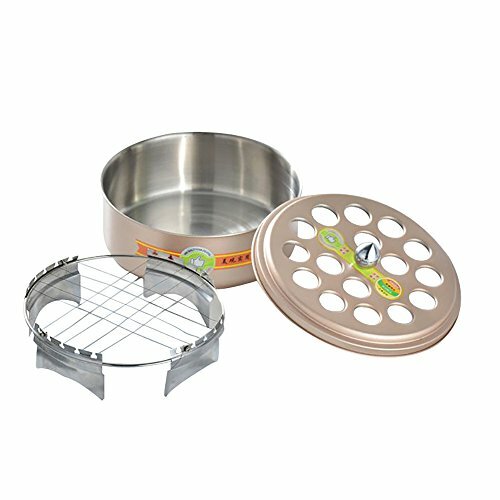 Mosquito Holder Is Made Of Stainless Steel Metal, Which Is Easy To Clean And Reuse. Each Mosquito Coil Holder Is Large Enough To Accommodate 5.3 Inch Mosquito Coils Or Incense Coils. The Humanized Protection Design, While Simply Adding A Hollow Cover, Is A Good Way To Avoid The Danger Of Similarly Exposed Mosquito Coils, Reduce The Occurrence Of Fire Conditions, And Effectively Treat Blood-Sucking Mosquitoes. A Good Helper To Eliminate The Annoying Mosquitoes Mosquito Is A Very Harmful Insect, Carrying A Variety Of Unknown Harmful Bacteria In The Body. While Sucking Your Blood, It Has A Certain Chance Of Spreading Harmful Bacteria. You Must Stop This Dangerous Situation. If you have any questions about this product by LI-GELISI, contact us by completing and submitting the form below. If you are looking for a specif part number, please include it with your message.